The next step, while waiting for parts to arrive, was to dismantle and thoroughly clean out the EX475. Physically cleaning out all the dust is easily achieved with the use of an air compressor and blower nozzle, which is my tool of choice. 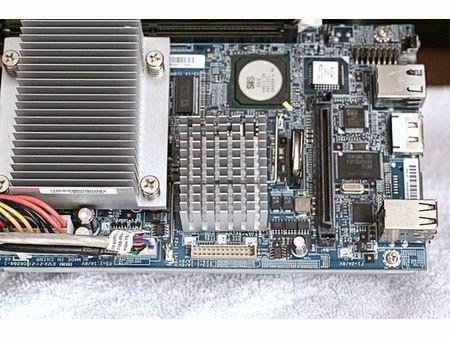 Having spent a considerable amount of time on various HP Home Server forums, I've learned from many owners that these units tend to run extremely hot, especially the Northbridge chipset (under the aluminium heatsink shown above in the center). 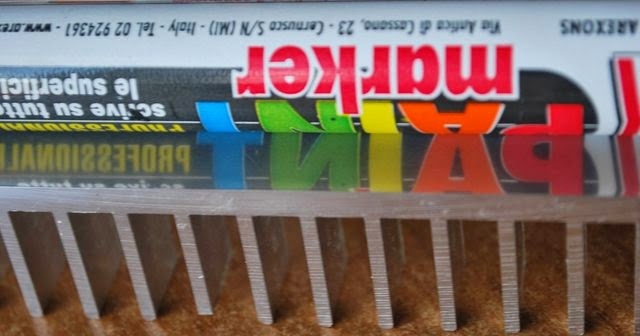 A simple solution to cooling the Northbridge chipset is to remove the aluminium heatsink, clean off all the stock thermal transfer paste, and reapply the heatsink using a good quality thermal transfer paste. I was originally going to do just that, but a visual inspection of my Northbridge heatsink revealed it was quite crudely machined, and had ridges (as you may be able to make out below). When a heatsink isn't completely flat or smooth it allows air to get trapped between the processor and heatsink resulting in poor heat transfer. Generally a good thermal transfer paste will remedy this but an even better solution is lapping. 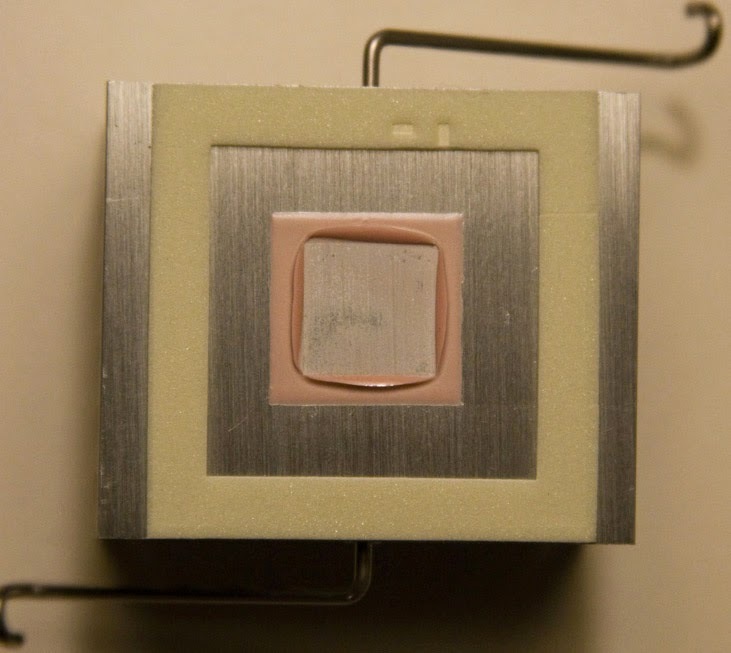 Lapping is a process of sanding down a CPU or heatsink to achieve a flat, smooth, mirror like finish. While I never did manage to get a mirror quality finish from the Northbridge chipset heatsink, I did remove the ridges to the point of having a somewhat fairly reflective finish (really wished I had taken pictures during this build). All my parts finally arrived, and I immediately installed the 4GB RAM module, which was quite easy once you have the EX475 disassembled. Next I installed the VGA-Adapter, which was also quite easy, it plugs in and only goes in one way. Before reassembling, I attached the power cable, monitor, and a USB keyboard, turned the EX475 on and booted into BIOS. So far, so good as BIOS revealed that the 4GB RAM module had been accepted and was working properly. After powering down I attach the SATA HD riser and dropped in a freshly formatted 2TB hard drive. In order to upgrade the CPU I needed to modify the BIOS, but before I could do that I needed to install an operating system (in hindsight I probably could have gotten away by booting off a live distro USB). I already had WHS 2011 available, on a USB (if you need information on creating a bootable USB drive check out this link), so I used that as a base operating system. Even with 4GB of RAM, the EX475 has little business running WHS 2011, as this installation process took forever. I then followed the steps outlined here to hack my EX475’s BIOS (** Please be careful if you're attempting this). I was now ready to swap CPU's. I powered down the system, removed the stock heatsink and CPU, lapped the CPU heatsink to a mirror shine. I proceeded to install the new AMD X2 3250e with new thermal transfer paste (I used Arctic Silver MX-2 thermal paste throughout this build, as it’s what I had on hand). I reattached the heatsink, partially reassembled the EX475 and powered it up. Nothing, it would no longer boot no matter how many times I flipped the power switch or how many power cables I replaced. I was filled with an uneasy anxiety, I had spent so much time getting to this point, and all seemed lost. In desperation I reverted back to the original CPU and I was once again greeted by a friendly, but slightly different BIOS screen. I was confused, the BIOS hack seemed to work, the system seemed to be responding as it should with the stock CPU, could the CPU I bought from Ebay be bad? Before lashing out at the world with a flurry of emails, I tried installing the new CPU one more time... and IT'S ALIVE! I don't really know why, but the system started up and BIOS revealed the new Dual Core CPU. The EX475 I purchased came with the original 'HP MediaSmart Server Recovery CD' version 1.1. While my original plans were to install WHS 2011 or Windows 8, I was really curious as to how my upgraded EX475 would perform running the originally intended proprietary operating system. While gathering information for this hardware upgrade, I happened to discover that HP had rolled out a final version 3, of their proprietary MediaSmart Server Recovery software, which would probably make more sense in installing. Unfortunately tracking down this software through legitimate means was proving to be more urban myth than reality. I was eventually able to obtain a copy of the elusive Version 3 software from unconventional channels (for those also seeking a copy can look here). Normally I would just create a bootable USB drive, as I had done earlier but with the HP MediaSmart Server Recovery and install off that. However I spent hours trying to get the HP WHS install disk to transfer over to a USB, and IT JUST WONT WORK! What I wasn't aware of at the time is that HP's proprietary version of WHS can only be installed remotely over a network from a client PC. Well I also spent hours trying to get this to work, and finally realized, after a good nights sleep, what the problem was. It seems the on-board network interface port on my EX475 had died, a problem that seems to plague a few of these machines. If you have a running EX47X with a blown LAN port there is a remedy found here. This solution will only work if you have a pre-existing operating system already installed. Seeing as my machine wasn't running an OS yet, this solution wouldn't work for me. I suppose at this point I could have just installed WHS 2011 or Windows 8, as I had originally intended, but I was determined to put on HP's proprietary software.